You use a double-angle formula to find the trig value of twice an angle. Sometimes you know the original angle; sometimes you don’t. Working with double-angle formulas comes in handy when you’re given the sine of an angle and need to find the exact trig value of twice that angle without knowing the measure of the original angle. 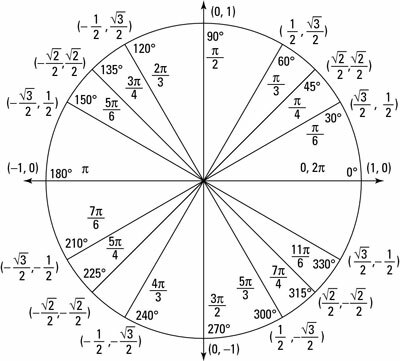 Note: If you know the original angle in question, finding the sine of twice that angle is easy; you can look it up on the unit circle (shown in the figure) or use your calculator to find the answer. However, if you don’t have the measure of the original angle and you must find the exact value of twice that angle, the process isn’t as simple. Read on! To find sin 2x, you must realize that it’s the same as sin(x + x). This formula is called the double-angle formula for sine. If you’re given an equation with more than one trig function and asked to solve for the angle, your best bet is to express the equation in terms of one trig function only. You often can achieve this by using the double-angle formula. Rewrite the equation to find a possible identity. Simplify the equation and isolate the trig function. which becomes sin 4x = 1/2. Find all the solutions for the trig equation. These solutions are the general ones, but sometime you may have to use this information to get to a solution on an interval. Finding the solutions on an interval is a curveball thrown at you in pre-calculus. For this problem, you can find a total of eight angles on the interval [0, 2pi). Because a coefficient was in front of the variable, you’re left with, in this case, four times as many solutions, and you must state them all. You have to find the common denominator to add the fractions. 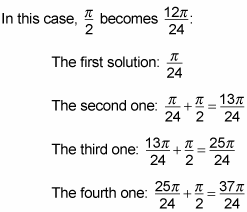 You stop there, because adding pi/2 once more would get you a solution that is not in the interval [0, 2pi).